What exactly is it that you are hoping for when you see a company advertising steel barns for sale? In today’s world, your steel barns need to be versatile. And you cannot just store your important equipment anywhere. You need a good building that will stand for a good long time, and keep the things that you need safe protected. So what are your options? You can build the barn yourself, but that takes time and is much more expensive than you would think. That leaves you with paying someone to build it, or buying a pre fabricated building. 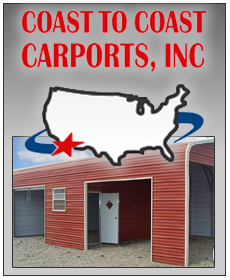 But if you want the best in steel barns for sale, then you need look no further than right here at Coast to Coast. It used to be that you had to build something yourself so that it was customized to your specifications. But we understand that your needs are the most important thing in a steel barn. That is why we offer you so many options to customize. Whether you need extra doors, wider frames, or a taller building, we can make that happen for you. You even get to choose the color your barn will come in, which gives you the opportunity to truly make your steel barn whatever you want it to be, without the hassle of building it yourself. And you are going to get a great product as well. No inferior materials here, only the best, highest gauges of steel to ensure that your barn lasts for years. In fact, we offer a 20 year warranty on rust through of framing on roofing material assuming normal user care and maintenance which is the best guarantee in the business. 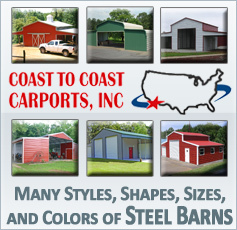 It is no wonder that when people think steel barns for sale, they think about Coast to Coast.